Hybrid flex/rigid waveguide. Note pressure port. When you are building up a waveguide experiment or system, you often end up with two waveguides that you need to connect, but you don't have a piece that is an exact fit between them, and you don't have the time and money to fabricate one. Or, perhaps your antenna needs to move with respect to your transmitter, and you don't want to use a rotary joint. Fear not, there is flexible waveguide for just such an emergency. Sometimes referred to by the portmanteau "flexguide", there are three primary types of flexible waveguide. One is flexible and twistable, the second is flexible non-twistable, and the third is flexible seamless. Both flexible twistable and flexible non-twistable waveguide are made from a helically wound silver plated brass strip, and additional mechanical support is offered from a variety of protective jackets. Flexible seamless waveguide is a thin-walled waveguide tube which is pressed to form the convolutions which allow it to flex – this is not twistable either. Much of the content on this page (and the best pictures) came from Tom Pearce of The Waveguide Solution in the UK. Be sure to visit The Waveguide Solution's web site and tell them you learned about them on Microwaves101. Many thanks! Flexible twistable is sealed electrically via a friction joint. This construction has the best twistable performance of all flexguides. The Twistable waveguide will hold limited pressure, but relies on the jacket for pressure sealing. Flex/Twist is not recommended for low passive intermodulation (PIM) applications. Flexible/twistible waveguide. Note choke flange on right-side end. Flexible Only core is wound with a solder fillet in the Interlock, thus eliminating any RF and Pressure Leakage. Flex/Only will flex in the E and H planes, although pre-set twists can be incorporated during manufacture. Flex/Only waveguide, before the jacket is installed. Flexible/seamless offers a solution to problems where pressurization is required. It has no solder joints and therefore can easily hold pressure. All three of these flexible waveguide types can be manufactured as either a straight section to be bent to shape, a pre-formed section which is jacketed and set to a predefined shape which then flexes about this shape, or as a hybrid part, incorporating flexible and rigid sections in a single flange-flange piece (as the picture at the top of the page illustrates). All these arrangements can be manufactured with a rectangular or double-ridge waveguide size. IEC60636 (was IEC636) is the relevant IEC specification to which commercial Flexible Waveguides performance is defined: “Defines principal electromechanical characteristics and test methods enabling the performance of flexible waveguide assemblies to be verified. 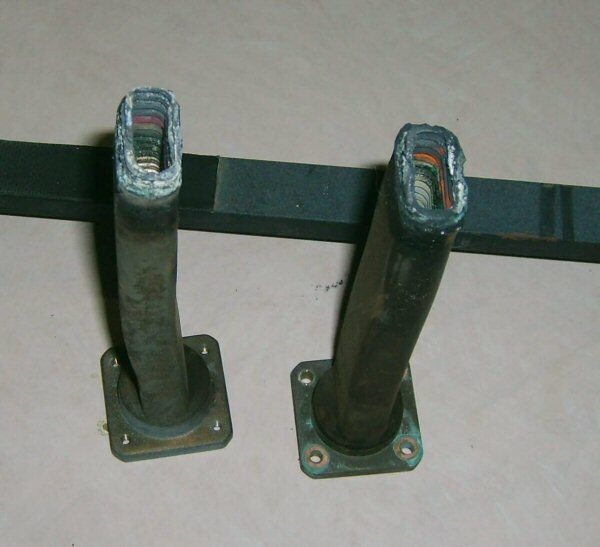 Contains terminology specific to flexible waveguide assemblies and specifies IEC type designation.” Along with the electrical performance measures this specifies the expected mechanical constraints and longevity of the parts and the method via which this should be tested – two figures are specified, the static ‘one-off’ bend radius, or the repeated bend radius to which parts must be able to flex/return 1,000,000 times. Below is picture which came from David, and appears in our Microwave Mortuary. It is no coincidence that flexguide is often the culprit in microwave failures, it is often used in rough environments and stressed beyond manufacturers recommendations. Click here to find Flexible Waveguides from the leading manufacturers on everything RF.